How often should you repeat your keywords? Keyword density. That’s a term that refers to how many times you use a certain keyword phrase on a web page as a percentage of the total number of words on that page. Some people offering SEO services hammer on about making sure your text has a certain keyword density (e.g. that 3% or 6% or whatever of your text should consist of your targeted keywords). There is NO magic number when it comes to keyword density in SEO. You know that Google – and other search engines – use many different signals to determine how to rank websites on their search results pages. But how many SEO ranking factors can you actually name? 10? 20? Google says it takes more than 200 factors into account in its ranking algorithm while Bing claims to use over 1000 signals. Of course, these ranking factors are not made public. Search engine algorithms also change over time, with new signals being added and others dropped. SEO experts have managed to get a pretty good grasp on at least the most imporant factors that play a role in search engine rankings. Is your website not as successful as you would like it to be? Do you think your website can be improved, but you’re not sure how? I can do a basic review, evaluation and analysis of your website and send you a report that identifies problems and includes possible solutions. I live in Coffs Harbour on the Mid North Coast of New South Wales in Australia and I love it here. 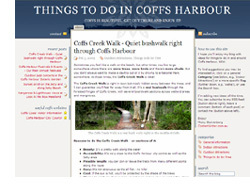 I have been writing content, stories and editorials for Coffs Coast Marketing for several years, helping to promote the Coffs Coast region – which is what the area around Coffs Harbour is called – to tourists and visitors. But there are many things that are so lovely here that I just feel like sharing with more people. Not just visitors, but also people who have lived here a long time, or who have just moved here.